The ground-breaking ceremony for the proposed new village of Dhaneti is held at the proposed new site. After ground-breaking for the new Dhaneti, the visiting Swamis tour the old Dhaneti. The village of Jawaharnagar, which I visited on February 4, taken two weeks later. The clearing of rubble is well underway. One of the swamis-in-training has supper in the garage at the school. Notice the plate that is formed from leaves. We passed this building on the main road in Bhuj as we headed toward Mandvi. We stopped to refuel the bus at this gas station. They are doing business from the table in the center of the picture. We were told that one man was trapped when the station collapsed, but was dug out alive. We are heading to Rapar with a busload of blankets and plastic tarps. There are nine of us, and only four seats that are not buried under blankets and tarps, so Swami Anand Maharaj and I make ourselves comfortable on the blankets. This kid is loaded with jewelry. Boy or girl? Im not sure. The survey team gets a thumbprint from a villager during the process of identifying families and issuing tokens. A family representative then takes the token to the bus and returns with the stuff. This pot is used by the Vishav Gurmat Roohani Mission to cook vegetables. We were told that they are equipped to serve 5,000 people. Here I am giving a 5 by 40 piece of plastic to a girl who seems not too enthusiastic about having her picture taken. This lady spent some time watching distribution from the bus and, Im told, entertaining everyone with her sense of humor. Chai is often poured from the cup into the saucer to cool, and in some cases they eliminate the middleman and serve it directly in the saucer. Here Im drinking chai given to me by the village couple to my left. Corrugated building sheets are stockpiled on the school grounds in Dhaneti for the next phase of the Ramakrishna Ashrams relief effort: shelter to get villages through the next few months until homes can be rebuilt. 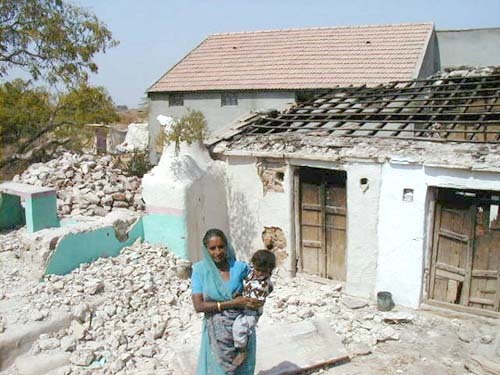 Illustrates the extent of the damage that is typical of the villages we visited.